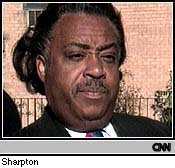 It's A Messinger-Sharpton Runoff In N.Y.C. NEW YORK (AllPolitics, Sep. 10) -- In another setback in an already tough race, New York Democratic mayoral hopeful Ruth Messinger failed to secure the required 40 percent in Tuesday's primary and faces a Sep. 23 runoff against civil rights activist Al Sharpton. Messinger finished first with 39 percent, followed by Sharpton with 32 percent and Queens city council member Sal Albanese with 21 percent. 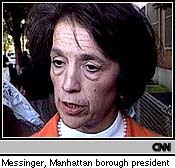 Messinger faces long odds in defeating the popular Giuliani and her failure to win the primary outright represents another sign of weakness. Her campaign has been criticized as inept and unfocused. "We're just going to have to win this thing the hard way, but win it we will," Messinger told her supporters. Sharpton's strong showing could be the result of his focus on police brutality and the case of Abner Louima, the Haitian immigrant allegedly beaten and tortured by police in a station house. "The real loser is Rudy Giuliani," Sharpton said. "We proved how out of touch he is with the voters of New York. The issues of unemployment, police brutality and the schools not working are on the front burner. You can run, Rudy, but you can't hide." 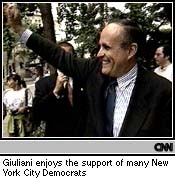 Giuliani complained that "vicious personal attacks" had turned voters off and depressed the turnout, which fell to a record low of less than 18 percent. In Detroit, Mayor Dennis Archer trounced all opponents in the city's nonpartisan primary, winning 82 percent of the vote. In November's general election, Archer will face state representative Ed Vaughn, who collected just 16 percent. Despite the lopsided primary results, Archer cautioned his supporters not to take the general election for granted. "We've come too far, built too many bridges, taken too many steps to be turned around," Archer said. "Something good is happening here." But Vaughn said he still has a chance if he can boost turnout. "The mayor could not turn out the vote," Vaughn said. "All we've got to do is turn out a few more in November and he's whipped." As in New York, turnout was also a low 17 percent. The city clerk blamed it on rain and an uninspiring race.